Tamil Union and Moors were assured of advancing to the final of the Under 23 Division One cricket tournament as they dominated the proceedings in the semi final encounters at the end of the second day’s play against Air Force and Colts at the Colts and NCC grounds respectively. 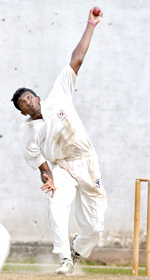 Tamil Union and Moors guided by career best knocks by Denuwan Rajakaruna and Shehan Jayasuriya amassed mammoth scores. Tamil Union spearheaded 165 which included 21 boundaries and two sixes by Denuwan Rajakaruna made an imposing 413 for 8 and declared while Moors steered by Shehan Jayasuriya who made 162. The opening day’s play saw Tamil Union who took first lease of the wicket end the day on a strong position with the right handed batsman Denuwan remaining unbeaten on 162. Denuwan was also associated in two fruitful partnerships – the first was a massive 202 runs stand for the fifth wicket with Gayan Manishan and then a 95 runs stand for the sixth wicket with Chathuranga de Silva. Air Force in their turn was made to struggle for their runs and was reeling on 46 for 3 at lunch before being bowled out for 155 with right arm spinner Ashen Silva doing the damage with 5 for 26. Tamil Union batting the second time ended day two by making 111 for 4 which gave them a commanding lead of 369 runs. Left hand batsman Shehan Jayasuriya too slammed a career best 162 to steer Moors to be on top against Colts. Moors having ended day one having scored 364 for 9 ended their innings by making 370. Shehan’s knock which came off just 156 balls comprised 21 boundaries and a six. He was involved in two century stands. The first being a 121 runs partnership for the first wicket with Shalitha Helambage and then a 134 runs stand for the second wicket with Isham Ghouse. Colts in reply was able to muster 193 with left arm pacie Narada Ratnayake ending with figures of 5 for 45 and spinner Maduka Liyanapathirana taking three wickets. This pair did the damage. Moors batting the second time made 104 for 7 and now have a lead of 281 runs. Tamil Union’s Matheesha Perera in action. Right arm off spinner Yohan Rashmika was the hero in Singha SC clinching the Under 23 Division Two cricket title as he ended with a match bag of 14 for 57 to guide his side to a comfortable 132 runs win over Negombo CC in the final concluded at Reid Avenue yesterday with a day to spare. The match was evenly poised at the end of the first day and it was Rashmika who changed the game and laid the foundation for Singha SC’s win. 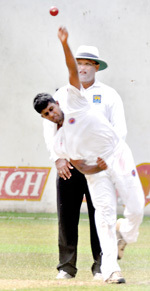 Ragama CC batsman Eranga Ratnayake in their match against Moors at Havelock Park yesterday.